Less than a month after Donald Trump took office, the public’s initial impressions of the new president are strongly felt, deeply polarized and far more negative than positive. The latest national survey by Pew Research Center, conducted Feb. 7-12 among 1,503 adults, finds that Trump’s overall job approval is much lower than those of prior presidents in their first weeks in office: 39% approve of his job performance, while 56% disapprove. The intensity of the public’s early views of Trump is striking: Fully 75% either approve or disapprove of Trump strongly, compared with just 17% who feel less strongly. Nearly half (46%) strongly disapprove of his job performance, while 29% strongly approve. This level of strong disapproval already surpasses strong disapproval for Barack Obama at any point during the eight years of his presidency. The only occasion when strong disapproval of George W. Bush was higher than for Trump currently was in December 2008, near the end of his presidency. 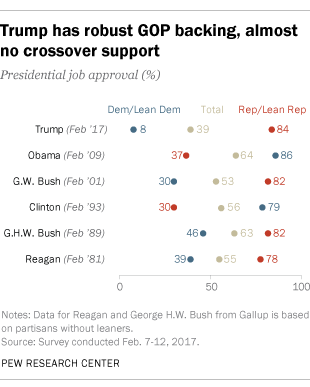 And while all presidents dating back to Ronald Reagan initially attracted at least modest support from the opposing party, Trump gets almost none. Just 8% of Democrats and Democratic-leaning independents approve of his job performance – by far the lowest rating for any new president from the opposing party in more than three decades. By contrast, 84% of Republicans and Republican leaners approve of the way he is handling his job as president, which is in line with the support past presidents received from their own parties. For more, see detailed demographic tables on Trump job approval. Opinion about Trump’s highest profile policy proposal to date – his executive order limiting entry to the U.S. by refugees and people from seven Muslim-majority countries – is similar to his overall job approval. About four-in-ten (38%) approve of this policy, while 59% disapprove. The public has a more critical view of how this executive order, which has been blocked by the courts, was implemented. Just 28% say that, regardless of their view of the policy, they believe the administration did an excellent or good job of communicating the order and putting it into effect. While 17% say the administration did only a fair job of implementing the policy, 53% say it did a poor job in this regard. 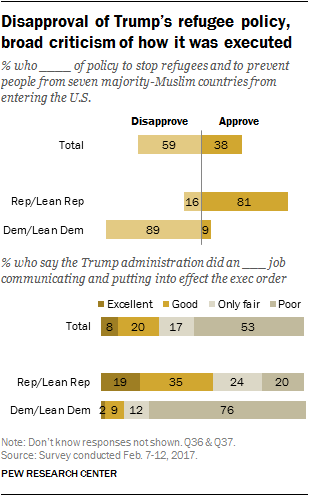 Even Republicans, who overwhelmingly approve of Trump’s job performance and the policy behind the executive order, have mixed views about the way it was carried out. While 54% say the administration did an excellent or good job of putting the order into effect, 44% say it did only fair or poor. The survey finds that the public gives positive marks to Trump on keeping his promises (60% say he does this) and his ability to get things done (54%). However, on seven other traits and characteristics – ranging from his temperament to whether he is a good manager – he is viewed more negatively. Just 28% of Americans say Trump is “even-tempered,” while more than twice as many (68%) say this phrase does not describe him. Trump’s ratings on the traits for which trends are available are lower than they were for Barack Obama, Bill Clinton or George W. Bush. At similar points in their presidencies, majorities said Obama (76%), Bush (60%) and Clinton (63%) were trustworthy. Currently, just 37% view Trump as trustworthy. While 39% say Trump is “well-informed,” nearly twice as many said that description applied to Obama in February 2009 (79%) and Clinton in January 1993 (also 79%). In early 2001, 62% said Bush was well-informed. Trump fares better relative to past presidents in views of his ability to get things done. While 54% say this description applies to Trump, only somewhat more (60%) said it described Bush in 2001. In February 2009, 70% said Obama could get things done. Improved views among Republicans help lift economic ratings. The public’s views of the nation’s economy – both current and future conditions – continue to be relatively positive. Currently, 42% rate economic conditions as excellent or good, up 11 percentage points since December. The share of Republicans who take a positive view of economic conditions has nearly tripled since then, from 14% to 40%, while holding more stable among Democrats. As in December, Republicans are much more likely than Democrats to expect economic conditions to improve (75% vs. 14%). Most continue to say Trump has little or no respect for democratic institutions. As was the case in October, during the campaign, a majority of Americans (59%) say Trump has not too much (25%) or no respect at all (34%) for the nation’s democratic institutions and traditions; 40% say he has a great deal (18%) or fair amount (22%) of respect for democratic institutions. Racial, ethnic diversity viewed more positively. Currently, 64% say having an increasing number of people from different races and ethnic groups makes the country a better place to live, up from 56% in August. About three-quarters of Democrats (76%) and 51% of Republicans think the nation’s growing diversity makes it a better place to live.